The International Pharmaceutical Excipients Council (IPEC) is working with its members and China’s Center for Drug Evaluation [CDE] to digest and manage the implications of the decision in China to switch from a separate approval process for pharmaceutical excipients to submission and review of an excipient dossier together with a drug application. A review of the way excipients are regulated by agencies around the world reveals that regional regulations continue to proliferate and the differences are creating problems for the manufacture, distribution and use of excipients globally. Novel excipients, drug master files (DMFs), and atypical actives are among the pressing issues on which the International Pharmaceutical Excipients Council (IPEC) is actively engaged with the major regulatory agencies and standards organizations around the world. The interpretation and application of the approaches for determining established conditions (ECs) provided in the Step 2 draft of ICH Q12 and how these interface with regulatory reporting expectations is drawing particular attention as industry explores the opportunities that the ICH Q12 concepts present in practice. The issue includes in-depth stories on: ● the intensive dialogue going on now in the wake of the emergence of an ICH Q12 Step 2b draft for public comment ● the role EFPIA’s European Biopharma Enterprises (EBE) is playing in identifying and building consensus around the most pressing issues on the global regulatory agenda for biotech manufacturing and control, and ● the experience at a leading in vitro fertilization (IVF) clinic in figuring out the cause of dramatic periodic declines in the clinic’s normal best-in-class success rates and what needed to be done to prevent them, including the development of much more powerful air purification technology. Pharmaceutical manufacturers are exploring how the ICH Q12 lifecycle management concepts can be implemented internally and in their interactions with regulators to maximize the benefits in practice. 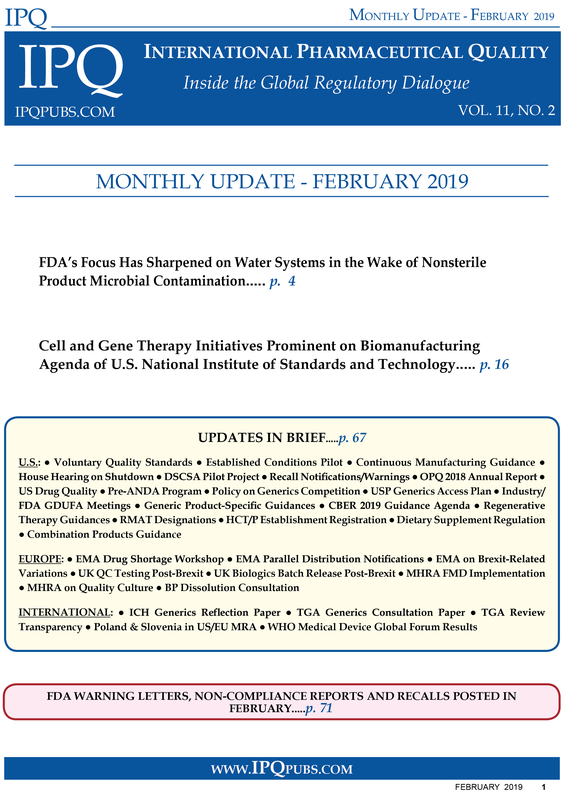 Industry and regulators in the US and Europe are making a concerted effort to improve the depth and clarity of their communications on the manufacturing and control of drug/biologic/device combination products. The three stories in this issue explore the challenges of melding the drug and device regulatory worlds and what is being done to address them. Industry experts are stressing that the payoff for combination products in understanding and bridging the drug/biologic/device terminology differences is a smoother development process, a simpler, more effective control system, and better communications with CMC reviewers and GMP inspectors.